Welcome to the official QuickWheel store! 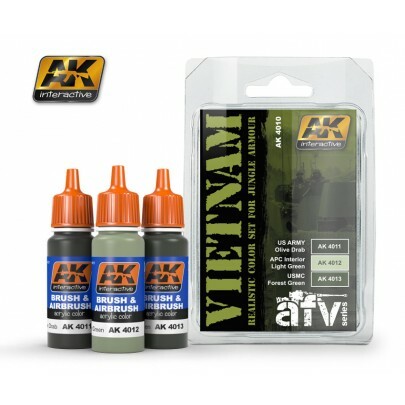 The three colours in this set will allow you to recreate the camouflage of vehicles used by U.S. Army and USMC during the Vietnam War. This set includes an olive drab colour, common for many U.S. Army vehicles; the special forest green colour used by the USMC, and a light green colour for painting the interior of the M113 APC. The formula of these acrylics is designed for both brush and airbrush, and they are soluble in water, meaning no odours, as you would expect from the more aggressive solvent-based paints. Our acrylics are manufactured by AK-Interactive, and are made from our own formula which prevents problems with them drying in the airbrush. Vietnam Color Set The three colours in this set will allow you to recreate the camouflage of vehicles used by U.S. Army and USMC during the Vietnam War. This set includes an olive drab colour, common for many U.S. Army vehicles; the special forest green colour used by the USMC, and a light green colour for painting the interior of the M113 APC. The formula of these acrylics is designed for both brush and airbrush, and they are soluble in water, meaning no odours, as you would expect from the more aggressive solvent-based paints. 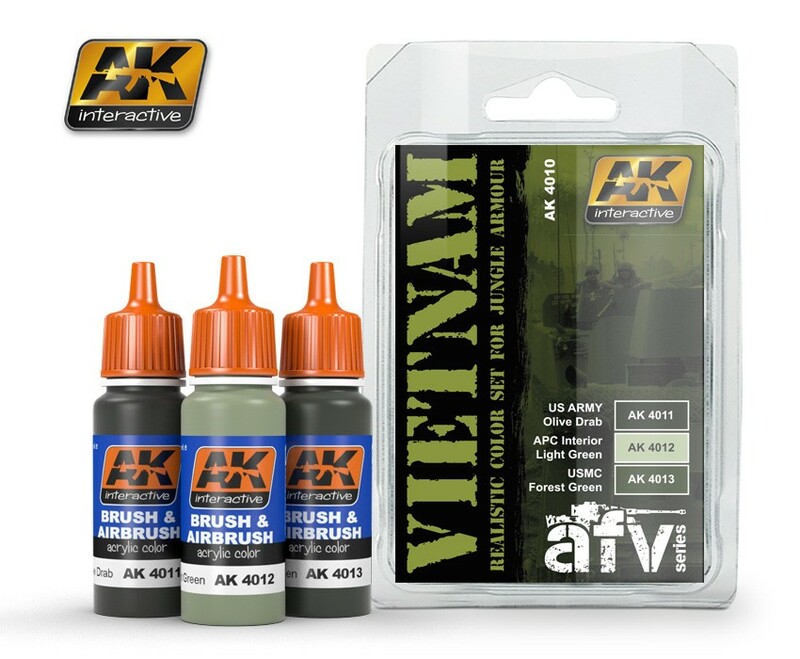 Our acrylics are manufactured by AK-Interactive, and are made from our own formula which prevents problems with them drying in the airbrush. 2018 QuickWheel Store. All Rights Reserved.